PORT JEFFERSON STATION, N.Y. (Sept. 14, 2015) – Atlanta-based Chick-fil-A, Inc. announced today the grand opening date and local franchise owner of its first freestanding restaurant on Long Island. The restaurant, located at 5184 Nesconset Highway in Port Jefferson Station, N.Y., is set to open Wednesday, Oct. 7 and will be independently owned and operated by local resident Stan Abrahamsen. As part of the grand opening celebration, Chick-fil-A will hold the First 100, a long-standing tradition during which the restaurant will give away a free year’s supply of Chick-fil-A (52 certificates) to the first 100 local residents – ages 18 and older with identification – in line on grand opening morning. The First 100 started in 2003, and Chick-fil-A has since given away $25 million worth of food at grand openings. The line officially opens at 6 a.m. on Tuesday, Oct. 6, and the one-year supply of 52 certificates for free Chick-fil-A meals will be awarded at 6 a.m. on Wednesday, Oct. 7. For a complete list of eligible zip codes and official rules, visit www.chick-fil-a.com/Locations/Openings. Also at the grand opening, the restaurant team will continue Chick-fil-A’s legacy of serving the community by giving back. During the First 100 and grand opening day, Chick-fil-A at Port Jefferson will collect new children’s books for kindergarten through second grade students that will be placed in a Book House and donated to an elementary school in the Comsewogue School District. The Book House, made of reclaimed wood, acts as a free library exchange by giving the community a chance to take one book if they leave another behind. One of many initiatives launched by the Chick-fil-A Foundation, the book collection supports Chick-fil-A’s dedication to youth and education. Members of the community are invited to bring books to support the Book House donation during the First 100 and restaurant hours on Wednesday, Oct. 7 and Thursday, Oct. 8. Scheduled to be open from 6:30 a.m. to 10 p.m. Monday through Saturday, the Port Jefferson restaurant was specifically designed for the needs of local residents and is equipped to handle large numbers of customers in a quick and organized way. Its features include a double drive-thru and a center-line kitchen, together offering the most efficient ordering, production and assembly capabilities possible. 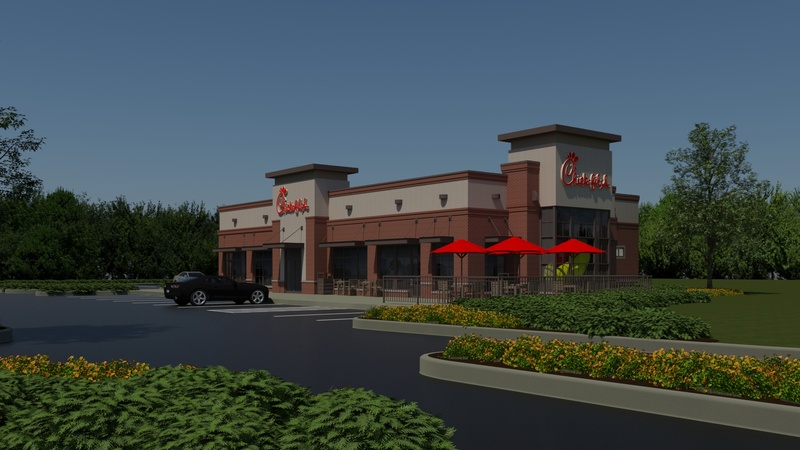 The restaurant parking lot will hold approximately 130 vehicles, and Chick-fil-A has partnered with the community to anticipate and proactively mitigate any traffic congestion. Featuring the company’s newest interior and kitchen design, the new location will seat 126 in the dining room. Franchise Owner Stan Abrahamsen is no stranger to the restaurant industry, with experience dating back to 1995. A New York native and graduate of Gordon College, he and his family live on Long Island, where he will be involved in all day-to-day operations of the Port Jefferson restaurant. Prior to beginning his restaurant career and being selected as the franchise owner for the Port Jefferson Chick-fil-A, Abrahamsen worked in sales in the commercial security and aerospace industries. Perfecting a recipe his mother used in her Atlanta boarding house, Cathy first served his boneless breast-of-chicken sandwich, pressured cooked and served on a buttered bun with two crucial pickles, at his Dwarf Grill restaurant which opened in 1946 in Hapeville, Ga. It was the signature menu item when the first Chick-fil-A restaurant opened in 1967 inside an Atlanta mall. Though joined by many other menu options over the years, the Chick-fil-A sandwich remains the centerpiece of the menu as the chain has grown to more than 1,911 restaurants in 42 states and Washington D.C.
Chick-fil-A’s menu of fresh, hand-crafted food offers a variety of options for guests. Signature items include a hand-breaded, boneless chicken breast sandwich, Waffle Potato Fries and hand-spun milkshakes. In recent years, Chick-fil-A has made a concerted effort to build its lighter menu offerings, adding items such as a revamped Grilled Chicken Sandwich, a new line of salads and wraps and most recently, a Greek Yogurt Parfait. The restaurant company has also continued to make its ingredients as simple as possible, removing high-fructose corn syrup from all dressings and sauces, artificial ingredients from the signature bun, TBHQ from the peanut oil and yellow dye from its chicken soup. In 2014, Chick-fil-A announced its commitment to serving chicken raised without antibiotics by the end of 2019, marking the first time a quick service restaurant had committed to a 100 percent“No Antibiotics Ever” standard for poultry. Chick-fil-A removed all trans-fat from the menu items and condiments in 2008, far ahead of the FDA’s 2015 requirement for restaurants to begin phasing out trans-fats. The Port Jefferson restaurant will use only premium ingredients and make many of its menu items from scratch in the restaurant each day, including hand-rolled biscuits and hand-chopped salads. In addition, Chick-fil-A at Port Jefferson will partner with regional farmers and suppliers to source locally grown ingredients for its fresh, handmade menu items. The majority of produce will come from farms in New York and New Jersey through Oceanside, N.J.-based distributor Food Authority, and all of the bread for Chick-fil-A’s signature sandwiches will be from Northeast Foods in New Jersey. Chick-fil-A at Port Jefferson will create approximately 80 new full-and part-time jobs, with team member hiring underway. Chick-fil-A is known for hiring, developing and retaining young talent, offering a supportive workplace with opportunities for leadership development, promotions that lead to management roles, the opportunity to earn college scholarships, respect for work-life balance (with Sundays off) and competitive wages. Over the years, the restaurant company, which employs more than 75,000 individuals through both corporate positions and franchised locations, has provided more than $34 million to help its team members pay for college. The new Chick-fil-A at 5184 Nesconset Highway is one of 88 new restaurants the chain plans to open across the country in 2015, creating more than 7,400 new jobs. Atlanta-based Chick-fil-A, Inc. is a family owned and privately held restaurant company founded in 1964 by S. Truett Cathy. Devoted to serving the local communities in which its franchised restaurants operate, and known for its original chicken sandwich, Chick-fil-A serves freshly prepared food in more than 1,900 restaurants in 42 states and Washington, D.C.
Chick-fil-A system sales reached nearly $6 billion in 2014, which marks 47 consecutive years of sales growth. Chick-fil-A ranked first for customer satisfaction in the Limited Service Restaurants industry according to the 2015 American Customer Satisfaction Index and received the highest ACSI score ever in the industry. The company was also recognized in 2015 as America’s “Top Chicken Restaurant Brand” by The Harris Poll and the only restaurant brand named to the Top 10 “Best Companies to Work For” by 24/7 Wall Street. More information on Chick-fil-A is available on the chain’s website located at www.chick-fil-a.com.